This is my belated response to the Connected Courses question: Why do you teach? What gets you up in the morning? What’s your core reason for doing what you do? It may not necessarily be a direct answer, but it at least addresses one thing, I don’t teach to the technology. Yesterday in the midst of my battle with Compass and reports, I received a call from the office that someone wanted to speak to me. 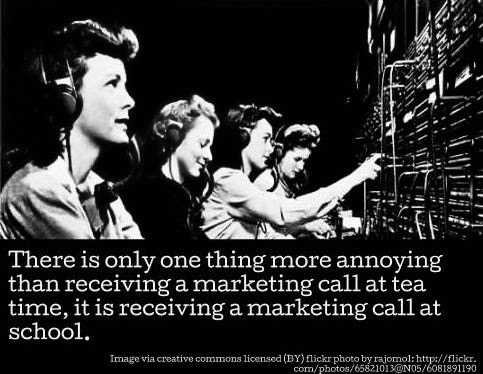 I took the call only to discover that it was from a technology company making a cold call. The guy on the other end, lets call him Derrick, was ringing to spruik a product that his company was developing around feedback. Sadly, he got the wrong guy. After telling him that I didn’t have time, I then explained to him that +Steve Brophy and I had actually presented at the recent DLTV Conference on dearth of options available surrounding listening to voices in and out of the classroom. We therefore already have all the tools that we needed to make a difference. The problem though wasn’t the technology, instead it was constraints of system. For example, the Performance and Development Process fosters a fixed mindset, with the focus on passing and failing, rather than lifelong learning. I think that Cathy Davidson captured this problem best recently when, as a part of the Connected Courses course, she suggested that, “Once you put a failure in education, you skew the whole system to avoiding failure” I think after I’d finished outlining what I thought was the real challenge with feedback, poor Derrick was a little flabbergasted. I don’t think he was expecting me on a Friday afternoon. There is something else going on here though. Having spent quite a bit of time with tools over the last few weeks, attending a range of conferences and courses, what has become more and more apparent is that it isn’t a tool that will magically solve all of educations ills. No, it is people. I was really taken by a comment that +Dean Shareski recently made in regards to Connected Educator month that, “being a connected educator is important but I think being a reflective educator trumps that.” What is significant about this is that more than creating a Twitter handle or developing Diigo community, we need to first and fore-mostly focus on people. Adding technology to anything, no matter how fantastic it may be, will only amplify what is already there. If people don’t share ideas and resources in person they certainly aren’t going to share online. It was so interesting that at the recent Google Teachers Academy in Sydney that for their moonshots many people focused on learning, teaching and people, rather than the actual use of technology. Whether it be about fostering disruptive pedagogies, supporting lone nuts or encouraging curiosity and creativity. It is easy to look back and say that the Ultranet failed because it was a poor product. However, I still believe that where things went wrong was the focus being on the program, rather than the pedagogy. I think that this all comes back to the why. In the end, we can have all the tools in the world, but if at the heart of it all is not people, connections, communities and relationships, then something is wrong. Although technology may help strengthen and support such things, if we don’t have them prior to adding in technology to the mix, then don’t be surprised if technology flops. Below is a great presentation from Mike Wesch addressing the question of why. #whyiteach and the answer is not technology by Aaron Davis is licensed under a Creative Commons Attribution-ShareAlike 4.0 International License.